A fridge that can request New parts! It’s 2019 and gone are the days when your refrigerator was merely a simple unit to store leftovers. Today’s smart fridges go much beyond that and with their enhanced artificial intelligence capabilities, provide an unparalleled customer experience. Let’sunder stand just how a smart refrigerator works. What does a smart refrigerator do? Also known as an Internet refrigerator, a smart fridge is able to recognise and effectively manage the items inside it. Being Internet-enabled, this fridge operates using a barcode or RFID system in order to automatically detect the type of items and track critical information including usage and expiry dates of products stored within. The functionality of a smart fridge also extends to managing diagnostic events related to its components. For instance, when the fridge is attached to a network, it can immediately communicate with the manufacturer when the need for as prepare rises. This efficient use of technology can be credited to the Internet of Things, or IoT. What does IoT contribute to this technology? The IoT yields benefits not just for the end user, but also the product manufacturer. These include a lower cost of maintenance, enhanced service delivery levels as well as a simplified maintenance procedure. For the consumer, tangible benefits include a smart fridge that lasts longer and functions efficiently. In addition, the user does not require to monitor the appliance on a regular basis to ensure that is it performing optimally. For the user and manufacturer both, understanding how to maximise the benefits of IoT-enabled appliances is critical, because this application design is fast becoming the norm. One of the major advantages of using a smart home appliance is that not just daily usage is easier, but service requests can be managed as well. Whether a part requires replacement can be determined with this emerging technology, and its warranty status determined as well. If a part is under warranty, a replacement can be ordered automatically. The system allows for a work order as well as a payment authorisation request to be created, for those parts which are no longer under warranty. On an integrated platform, all these workflows come together to complete a framework that can enhance service levels using the above services. The process flow illustrated below is how the system functions. The refrigerator periodically sends an MQTT message with a JSON pay loadtotheWatsonIoT PlatformserviceonIBMCloud. The first action analyses the message to see whether, for example, the filter life reading is within an acceptable range. If the reading is normal, no further processing is done, which provides a highly efficient and cost-effective workflow. If the part needs to be replaced, the action creates a service reportinaCloudantdatabase. Another action, which is triggered by the creation of that new service report, looks up the customer and appliance registration information to determine whether the appliance is under warranty. If it is under warranty, the action automatically orders the replacement part and sends an email notification about the status of the appliance to the customer.No further customer input is needed. If the appliance is not under warranty, a pending order is created and a payment authorisation request is sent to the customer. When payment is authorised, the pending order is automatically sent for completion. A final action alerts the customer by email about the status of the appliance.This action is triggered by the creation of the replacement part order. When the appliance warranty is within 30 days of expiring, an overnight batch job triggers an email notification to alert the customer that the warranty is about to run out. Know at length how this serverless technology gives rise to smart appliances that result in ease of operations. Find the detailed steps for this pattern in theREADME. The functionality of being able to communicate regarding spares is onefacet of what this technology can offer. Additionally, a smart fridge scan provides value-added features including internal cameras and flexible user-controlled options. Technology is advancing such that a fridge can communicate with other devices in the home, for instance, a microwave, dishwasher and even a music system. Some smart refrigerators offer a touch screen interface and via Internet connectivity can perform functions including looking up recipes and reading out the instructions, creating grocery lists that can be synced with a smartphone and even customise the temperature by drawer or compartment. Good-to-have features such as providing alerts when the water filter needs changing and being able to turn the ice maker offer on from a smartphone can also be activated. A smart fridge and the technology it adopts indeed make for an interesting package. It is the perfect example of marrying user requirements with those of the manufacturer to deliver a product that automatically takes care of things. This, in turn, ensures that at the user and manufacturer end both, productivity need not be expended don’t ask that otherwise can be seamlessly carried out without intervention. 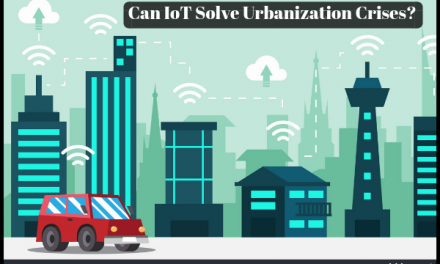 Can IoT Solve Urbanization Crises ?